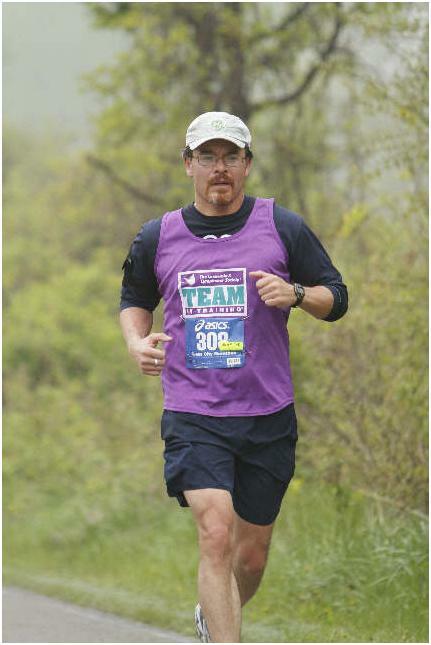 This past Sunday, April 25 2010, I ran the Glass City Marathon in Toledo, Ohio. I had the honor of running as the coach for our local Team In Training for the Leukemia and Lymphoma Society in support of cancer research and patient care. It turned out to be a good day for a marathon and a great day for our Toledo TNT group. All of our runners did well and finished the marathon better than or close to their goal time. They also raised about $20,000 for LLS! All of this came after a long winter training schedule. These runners came out and ran double-digit miles in single digit temperatures on more than one occasion. They put in 16 mile, 18 mile, and 22 mile runs and found time to smile about it. They fundraised and fundraised some more. They took the lead and ran with each other when someone couldn’t make a team run. They encouraged each other when it got tough. They never gave up no matter how tired and sore they got. These runners are heroes with heart! Here’s a quick rundown on their Race Day Performance: We had 8 runners completing this race for their LLS fundraising campaign and we had 3 runners running this race in preparation for another race and their LLS fundraising campaign. We also had 5 other runners that are alumni of the TNT program or great friends in support of a TNT’er. Many of them had personal record (PR) finish times. It was a great showing all together! TNT’er Lynne Forsythe completed her first full marathon in 4:29:27. TNT’er Erin Baker completed her first full marathon in 5:39:35. TNT’er Scott Sandvik completed his first full marathon in 4:05:33. Liz Roberts completed the 1/2 marathon as a friend of TNT. TNT’er Beth Grafing completed her first full marathon in 4:32:25 as part of her TNT training for a triathlon in August. Jim Hunt completed his 16th marathon as a friend of TNT. TNT’er Laura Lehrian completed her second half marathon in 2:31:24 with a 16 minute PR (despite working 80 hour work weeks.) TNT’er Bob Bethel completed his 8th full marathon in 5:03:26 (after straining his back the day before.) TNT’er and Team Mentor Corey Monarch, completed the 1/2 marathon as part of her TNT training for the San Diego marathon in June. Don DeSloover completed his second marathon as a TNT Alumni in 4:19:33 with an 8 minute PR. Kathy Sloan completed her first full marathon in 4:26:45 as a friend of TNT. TNT’er Jenny Carpenter completed her first full marathon in 5:17:27. TNT’er Kevin Drouillard completed his second 1/2 marathon in 2:19:23 with a 6 minute PR (and he just started running last November.) Monica Drouillard completed the 1/2 marathon in 2:19:24 as a TNT Alumni (and let Kevin win by 1 second.) TNT’er Kimberly Hasapes completed her second full marathon in 5:03:26 with a 15 minute PR. His name is Frank Cody and he’s a long time runner and a good friend. He completed the marathon in a blazing 4:01:55 which was his first full marathon since 1998 and a 25 minute PR. He also finished 3rd in his age division which is a bunch of old guys. And better yet, he ran a 1 minute negative split which means he ran the second half of the race 1 minute faster than the first half! Not too many people can run a negative split marathon! In short, Frank was awesome! Everyone on the team and our alumni and friends did a great job! I was honored to be their coach for this season. Hopefully, there will be many more seasons to come! Thanks for all of your support and encouragement and thanks for helping fight the good fight! Congratulations to all who participated! Everyone of you is an inspiration. I applaud you! But I noticed that there isn’t any times posted for the Coach’s race? ?